When I embarked on my flight to San Francisco for the KonMari Consultant Seminar, I truly had no idea what to expect. Aside from a brief but very encouraging email exchange with a newly certified consultant in British Columbia, I was going in blind. All I knew was that I had totally drank the proverbial KonMari Kool-Aid and I was itching for more. Armed with my journal (and a pen that sparked joy) I gathered with 62 other "Konverts" in the Hotel Kabuki, awaiting the start of something exciting. Kondo walks among us as we share ideas at the conference in San Francisco. We were greeted by Team KonMari and then had the absolute pleasure of being addressed by Ms. Marie Kondo herself. Despite her diminutive frame and gentle demeanor she had us all in complete rapture. Clearly, we were a captive audience-- I later learned that many people had flown in from all different parts of the world to attend. This was only the third seminar hosted in North America, and there were delegates from as far away as Germany, Poland, England, Australia and of course Canada (represent!) During the morning session Kondo covered her history and the origins of her signature method. She, of course, spoke in Japanese, which was translated for us by a translator. She handed the session off to Ms Mitsugu Ando, the lead of the Japanese Consultant Association, who conducted the bulk of the next 3 days. At the end of the seminar I was asked by a friend if I was "a folding expert yet". I actually laughed out loud when she asked, because, although I had no idea what to expect from the seminar, I was pleasantly surprised that we spent no more than an hour discussing the minutia of folding. Although an important component of the method, folding was not high on the list of important topics covered. Most importantly we learned about how to work with people. How to listen to people and how to try to understand their feelings and beliefs around their belongings. In order to help someone declutter and reorganize their space and their life you must truly understand their emotions and motivations. Also incredibly interesting was having the opportunity to listen to the knowledge and suggestions from the other delegates. In addition to being from many different countries, the people in attendance came from a plethora of different backgrounds. 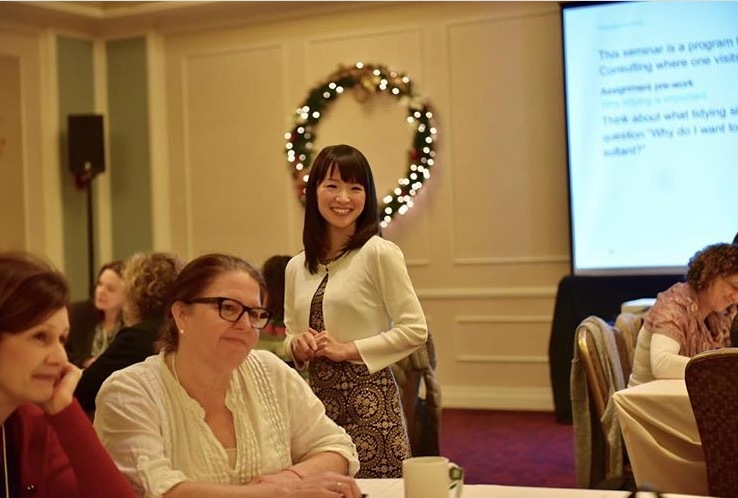 Of course, some were already professional organizers or home staging experts, but there were managers of tech companies, sales people, retired bank managers, young moms, website and graphic designers... it reinforced my belief that many aspects of Kondo's method are universal. The entire seminar was conducted in Japanese through a translator, so technically it took twice the amount of time it could have taken to cover all material. In my opinion this was a good thing. It gave me time to process what was being shared and to really think about my approach. I took so many notes, and had so many "A-ha" Moments. Kondo returned on the last day for the final session and to award us our Certificates of Completion. When it was my turn to accept my Certificate I completely FanGirled, milking my time with Kondo, thanking her in both English and Japanese. When I returned to my table another delegate jokingly asked if Kondo and I had a lunch date planned next week, because clearly we were now besties. I left San Francisco on a (shockingly frosty) Monday morning, warmed with the feeling of excitement that comes from being surrounded by people who want to make an impact in other people's lives. Kondo and her hopeful consultants. If you look closely you can see Danika, laughing like an goofball (after giving Marie bunny ears for another picture). No surprise there. All Rights Reserved. CURATE 2019.